There will be R $ 15 thousand in prizes. Share on Facebook The hall is ours! The Salon brings again another contest aimed only at the children aged 6 to 12 years: the "Medplan Hall of Humor", which brought as a theme MY PREFERRED JOKE. Entries are due until June 18. The Organizing Committee of the Medplan Salon of Humor decided to anticipate the date of inscriptions from April 2 to March 18. "As soon as we released the theme, we started to receive foreign works, and since we have everything ready, we decided to release the registration platform as soon as possible," says Jota A, curator of the event. In 2019, the theme that will awaken the creativity of artists from Brazil and the world will be "Narcissism". 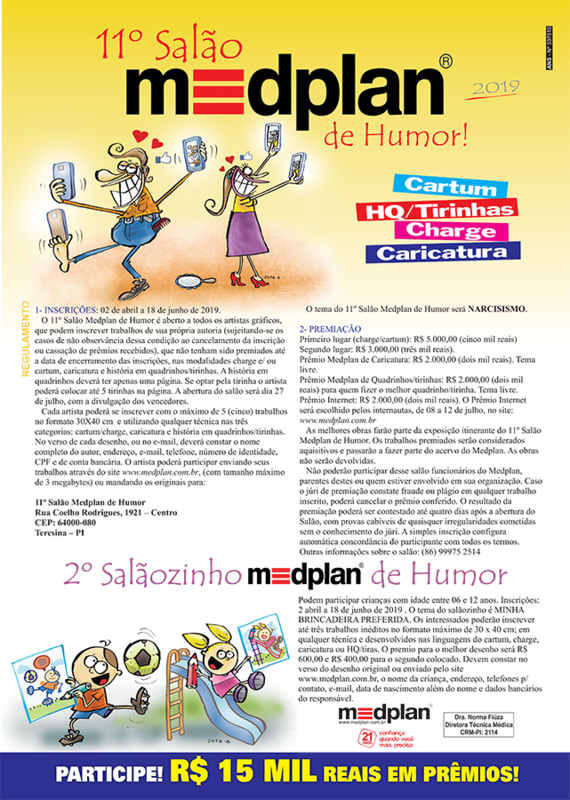 The Salon also has a contest aimed only at children from 6 to 12 years old: the "Salãozinho Medplan de Humor", which brought as a theme "MY PREFERRED JOKE". Entries are due until June 18. The Salon also brings awards to the categories of cartoons and comic strips, both with a free theme. The itinerant show with the best works and announcement of the winners takes place on July 28 (Saturday), at 6:00 pm, on the top floor of Teresina Shopping. The 11th Medplan Humor Lounge, which is international, is open to all graphic artists, who can register works of their own that have not been awarded until the closing date of the entries, in the cartoon and / or cartoon, cartoon and comic strips. Internet Premium: R $ 2,000.00 (two thousand reais).